What follows is the combined logs of our trip to the southern tip of Argentina and around Patagonia including a few days in Chilean Patagonia. We apologize for switching at random between the first-person singular and plural tenses. It would just be too confusing to try to sort out who is saying what. We're off on another long multi-hop plane trip. This one came a spur of the moment vacation idea when I realized I had nearly three weeks vacation time accrued and decided to semi-surprise John with a trip for a Christmas present. We are flying on VASP Brazilian Airlines. The connections are not ideal, but it was much cheaper than any direct or better connected flights. We have an 11 hour lay-over in Sao Paulo, Brazil, and find some comfortable leather couches at what will eventually be our departure gate. Several other flights depart from this gate before our turn rolls around and the lounge area alternately fills with people then becomes empty for an hour then fills again all day long. It feels a bit like being the camera in a time-lapse movie like Koyaanisqatsi. It's much more tedious being the camera than watching the action sped up! The plane takes off and flies for about 15 minutes when there is an announcement. It's in Portuguese and the only words I recognize are ``Sao Paulo'' and ``30 minutes''. A few minutes later I realize the plane has turned around which must mean we are heading back to Sao Paulo. No Portuguese speakers appear alarmed so I assume the plane will not crash. After a couple of hours on the ground, we take off again. This time we go all the way to Buenos Aires and we are finally ``there'' or at least in the right country. Our final destination is Patagonia, but we will take a break from flying and spend two nights in Buenos Aires before continuing to Ushuaia. We arrive at the international airport at 2:00 am. We didn't have any checked luggage so we were the first ones out and through customs. The guy at customs asked us something but our Spanish is too rusty to understand on the first go. He decided to just wave us through so it must not have been important. The bank and all other services at the airport are closed. There are fortunately, a lot of taxi drivers hanging about. We take a ride from a guy who is a dead ringer for the character Robert DeNiro played in Cape Fear. The taxi has no markings on it and no meter but the price he wants is in line with what our guide book says it should be. We asked the driver to take us to one of the mid price range hotels recommended by the Lonely Planet Argentina book. He seemed a bit unhappy with the address, and when we arrive we agree that the place looks pretty seedy. "Robert DeNiro's" insistence that this isn't a very good neighborhood convinces us to try another place downtown. We agree to go look at it. He takes us to the Hotel Rochester where we find the entire flight crew from our plane checking in in the lobby. We get an acceptable room for $84 with breakfast. We got up about 10 am and went to breakfast, a buffet of croissants, breads, pastries, juice and coffee. The flight crew came in a few minutes after us. We don't plan on having a very busy day today. We go out walking and head over to the tourist info kiosk a few blocks away. Buenos Aires feels a little like NY City with the number of pedestrians and cabs and the way people cross the streets. The info kiosk has a "back in a few minutes" sign so we continue walking and stop in at American Express. The currency exchange line is a mile long so we instead go to one of the many cambios and pay 1.5% commission and change some traveller's checks into pesos. The peso and the US $ are running at a 1:1 exchange rate and it isn't clear that we need to buy pesos at all since pesos and dollars are accepted interchangeably by everyone from hotels to street vendors. We do need to cash some traveller's checks so we get some pesos and have both monies. We go back to the info kiosk and get a map and a recommendation for a city tour since we will only be here one day and the city is very spread out. There is a three hour tour later in the afternoon which we decide to take. We returned briefly to the hotel then went out and found a nice little lunch. We try and watch what others are doing to get a clue about how to pay and whether people tip or not. This is one of the vaguely unsettling things about travel. Simple day-to-day operations like paying for lunch or making a phone call suddenly become an adventure. It takes a bit of getting used to, but I suspect this is a large part of the attraction of foreign travel. The tour lasted roughly from 3-6. We were both feeling a bit jet lagged (the time zone is 6 hours later than LA) and dozed on and off when on the bus, missing some of the tour guide's talk. The guide alternated between Spanish and English. Most of the other tourists were non-English speakers, but Spanish did not seem to be their native language either. There were several Italians and Brazilians. The guide's Spanish was consequently very slow and clear and we could understand a lot of it. It's been 16 years since three years of Spanish in high school, but some of it is coming back. His English was excellent, and the tour was a good introduction to the city. What did we see. The Cathedral Metropolitana which contains the tomb of General San Martin. San Martin is to cartographers in Argentina as George Washington is to cartographers in the U.S. Cities, plazas, towns, streets, and states all bear his name. Coincidentally, he was the leader of the independence movement that separated what is now Uruguay, Paraguay and Argentina from Spain in 1816. The church is across from the Plaza de Mayo which contains a monument surrounded by chalk line figures representing "disappeared" persons from the "Dirty War" of the 70's and 80's. The "Mothers of the Plaza" still march on Thursdays demanding a full accounting of the atrocities. The presidential palace and city hall were also in this area but we didn't have time to go inside. Next we went to the neighborhood called La Boca. This area contains a lot of brightly colored metal and wooden buildings. We stopped for a drink in a cafe wallpapered in money. It appears that visitors leave their name on a small denomination note from their country and tack it to the wall in this place. Next we drove through some nice neighborhoods and various things of interest were pointed out but I was lulled to sleep by the bus and missed some. We then visited the Recoleta Cemetery area which is next door to the Iglesia de la Nuestra Senora de Pilar, built in 1732. The cemetery was full of large impressive monuments. Many of the "head stones" were actual rooms with ornate furnishings where the family can enter. There were a few weird ones, too. One looked like an Egyptian tomb. Another was in the shape of a large pyramid. One looked like a moss covered stone house in miniature. Many contained glassed in rooms with stairways leading ominously downward. It wasn't clear whether it was just a facade or if the stairs really led to something. Evita Peron is buried here somewhere but we didn't find her tomb, as it is inscribed with her maiden name. After the tour we headed back to the hotel for a nap. We napped until about 10 pm and got up for dinner. We found a nice restaurant and ordered. John was happy with his meal, but mine was a huge hunk of meat. I had ordered a steak special of the house. I now think "especial" is fancy-restaurantese for "grande". I won't order the "especial" again unless I am VERY hungry. We got up early and found the VASP flight crew checking out of the hotel at the same time as us. However, they are returning to Sao Paulo and we will be heading on to "the end of the world" aka Ushuaia. We couldn't get a direct flight from Buenos Aires and will have to change planes in Rio Gallegos. We had a couple of minor screw-ups of the kind that happen while travelling. In Buenos Aires the person who checked us in at the airport counter spoke excellent English and clearly told us we were checked in for both flights. We also had boarding passes with seat assignments for our connecting flight out of Rio Gallegos. However, when it came time to board the plane in Rio Gallegos, which happened to be during a particularly chaotic period of the day (there were two planes boarding from one gate area at the same time but going in opposite directions), we were told we didn't have boarding passes and needed to go get them. Afraid we would miss the flight Lynn ran OJ Simpson-style back to the main terminal, checked in for both of us at the unmarked Aerolineas Argentina counter and raced back through the x-ray security check-point as fast as possible. John waited "calmly" at the gate, quietly humming Black Sabbath's "Iron Man" because when he had passed through the metal detector the first time every light and bell had gone off at once. We didn't think it wise to repeat the episode. We passed through the gate and were directed to one of the two planes warmed up on the tarmac. We were the last ones on and no one checked our boarding passes. Two people were in our seats but there were plenty of empties so we took two seats and stowed our gear. The alert traveler should register a certain misapprehension at this point, especially since our command of Spanish is "limited" to be generous. It took an announcement in Spanish on a poor PA system with only two recognizable words, "Buenos Aires" to get our adrenaline really pumping. Oh no! We're on the wrong plane! Fortunately the stewardess call-button is not one of those every items that become an adventure unto themselves, and we are able to summon a flight attendant who reassures us that we were on the correct plane. Finally we arrive. The landing in Ushuaia is not for the faint of heart. The plane flies directly toward the mountains behind the town, making a very hard left turn at very low elevation (license-plate-reading elevation) followed by a hard landing in a 30 knot cross wind, and a plane-shuddering application of FULL reverse to slow down before the runway ends in the Beagle Channel. Ushuaia is a very pleasant, pretty town. Somewhat reminiscent of a Swiss town nestled against snow capped mountains with the deep blue Beagle Channel thrown in as an added bonus. Isla Navarino with its snow-capped peaks is across the channel, maybe 5 km distant. There are a few cargo ships at anchor and a couple dozen pleasure boats in the harbor. Many of the walls in town are painted with striking murals. Many of them have strongly environmentalist themes, and others seem to be political (in the sense that Guernica is political) but I don't know enough about Argentine politics to know who is attacking whom. We had no trouble finding a room for $45 at the Cesar Hotel after which we went for a walk and picked up some pastries at a bakery since we are between mealtimes. We also stopped for some high-octane double cortados (coffees) and then set about planning a course of action for the rest of our trip. We found the tourist info bureau extremely helpful and gathered info. The tourist bureau has a very well organized database stored on a computer capable of printing out what a tourist asks about in a choice of languages so they have a large amount of information without wasting paper on brochures that might not be wanted. Unfortunately, things don't look too good for getting from here to Chile as we had hoped. We visited the "Fin del Mundo" Museum and got some postcards. The museum is a 3-room affair with areas devoted to natural history, native artifacts and materials from early European explorers and settlers like a facsimile of the log of the Beagle, and a copy of Thomas Bridges "Dictionary of the Yaghan Language". The captain of the Beagle was FitzRoy, presumably the same as the mountains a little further north in Argentina. Charles Darwin, of course, was the Beagle's most famous passenger, acting as naturalist. This is the first of a series of excellent small museums that we encounter in Patagonia. We had a late supper of paella and then finished up the day realizing that it was nearly midnight even though the sun was just setting. This results from a combination of two factors. We are at 55 degrees south latitude, a few days after the summer solstice. The nights are only 7 hours long. In addition, we are approximately two time-zones "wrong", if one judges by degrees west of Greenwich. It's the last day of the year and we are at the end of the world! At least that is a common nickname for the city of Ushuaia which holds the distinction of being the most southerly permanently occupied city in the world. There is some contention from Puerto Williams, a military base in Chile which is much smaller but is located a little farther south. Many businesses in Ushuaia have signs such as Hertz, "the most southern rental car office in the world", and the like. We bopped around a bit in the morning checking airlines and travel agents for flights out of here. LADE seems to have stopped running flights to Calafate and a travel agent told us no one else flies there. All the flights to Punta Arenas are booked so we arranged a flight back to Rio Gallegos for Monday and plan to get a bus to Calafate from there. We ate lunch at the Cafeteria Ideal and tried their special pizza. It was quite good with cheese, ham, eggs, and sweet pepper toppings (no tomato sauce). 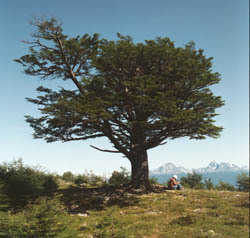 We then caught the bus out to Tierra del Fuego National Park. We spent a few hours walking along the trails before getting the bus back to town. Our first sighting in the National Park was of Salmon Island. Naturally, we each took a picture. We probably walked about 10 km altogether over easy, flat terrain. Many of the trails are well marked. We spent a while puzzling out a large sign describing the formation of a peat bog at the end of one of the trails. We saw a lot of bunnies at the park. They're pretty unconcerned about people and just continue munching on the clover until you get within a few feet of them, at which point they hop a few feet further on and resume eating. We spotted a beaver working on building a dam in one of the streams. There were numerous tree trunk remains looking like the beaver had chewed through and was causing massive destruction in the immediate vicinity. Both the beaver and bunny rabbits are foreign introductions so their populations are running somewhat unchecked. The beavers were imported from Canada in 1946 to start a fur trade and have become something of a pest, killing large areas of forest with their artificial lakes. We also saw a number of ducks plus a few other birds. We were in luck with beautiful clear sunny weather about 70 degrees F. It had been in the 50's and windy yesterday but also clear and sunny. After returning from the park we found the town pretty much closed up for the holiday at 9:00 pm. We are unaware of what type of New Year's Eve celebrations may be going on, but we're tired and will probably just go to bed early. Bueno Ano Nuevo. Evidently the town was partying hard last night. We were awaken at midnight by all of the car horns in the city honking in the new year. We went back to sleep but I awoke on and off and remember still hearing horns honking as late as 3:00 am. Today went well. We found most of the shops closed for the holiday but that was expected so didn't hamper our plans. After a hearty lunch we headed out to Tierra del Fuego National Park again to do more hiking. Buses to the Martial Glacier just outside of town weren't running today or we would have gone there. We arranged with the bus driver to be let off somewhere other than the usual bus stop location in the park. We wanted to get off at the base of the climb to Cerro Pampa Alta which was on the road on the way to the usual stopping place. This was fine with the driver who agreed to meet us back there at 8:00 pm. The climb was easier than described in the literature we had and took less time then expected. The walk up parallels a stream for about 1 km, at the top of which is a HUGE beaver dam. Then it turns east and goes through a dense beech forest. The trees have several kinds of parasites. One of them is called "Indian bread" because some part of it is apparently edible. It consists of large "tumors" some of which have a golf-ball sized orange "fruit" growing on them. We aren't sure which part is meant to be edible, so we pass on the culinary experience. Many trees also have a hairy green lichen called "Old man's beard" growing on them. In some places it is so thick it looks like fur. It looks like it is attached very tenuously, but I gave it a hard tug, and it held fast. I guess if it weren't attached pretty well it wouldn't last long come winter. The trail ends in a large open field with a very wet and spongy ground at one end, but high and dry at the other end. There are lots of small alpine flowers forming a colorful carpet, and the spongy areas are covered with a short grass that would be the envy of the greens keepers at our municipal golf course. It is much healthier than our lawn at home!! We spent about an hour at the top just taking in the views of the mountains, lakes, channels, snow and sky. The sun is quite strong, and I get a slight sunburn despite the 55 degree latitude and SPF 15 sun screen! The mountains are very jagged, with very well-defined tree-lines and scrub-lines. The day was another beautiful clear day with 70 degree weather and there is almost no wind despite our exposed location in an open field on the side of a mountain. The channel, a couple of km distant looked perfectly calm. We relaxed and read for a while at the top before heading back down to the beaver dam we had passed on the way up. Although today appears to be celebrated similar to the 4th of July in the US with many families out picnicking, they were in a different part of the park and we were all alone at Cerro Pampa Alta. We found 3 German tourists at the beaver dam busily photographing the beavers. It would appear that they own stock in Kodak judging by the speed at which they are going through film. We stopped and watched the beavers for about 45 minutes since we were early for the bus. I now fully understand what busy as a beaver means. There were two beavers continuously swimming about dragging sticks to the dam and shoving them in and we found them fascinating to watch. The artificial lake was really huge, at least a couple of acres. Some of the trees that had been cut down were 16" in diameter. These two beavers have been working for a while! When we decide to leave, we just about trip over one of the beavers who came up on land to get a particularly large branch. We get caught up in his endeavors, and return to our appointed bus stop a couple of minutes after 8:00. Since the bus was going to be picking up others at the regular place at 8:00 we didn't expect it until 8:15-8:30 so we weren't worried. At 8:20 we saw our bus drive by without even slowing down. Panic Time! There was a lot of traffic and many people milling about where we were at the time so it's possible that the driver didn't see us. Or maybe he just forgot. The panic passes quickly and we started walking in the direction of town (~15 km away). We were debating whether we really wanted to walk the whole way, but the ranger station was on the way and we decided to see how we felt when we got there and possibly call a cab or hitch a ride at that point. Despite the late hour, we could probably walk all the way back to town in daylight, and even manage to find dinner upon arrival because the Argentines dine so late. After about 20 minutes walking, when we were half way to the ranger station, our bus came back from the direction of town. He picked us up and we and the driver each tried to communicate what had gone wrong. Since everything depended on the precise comprehension of pronouns prepositions and tenses, communication was not successful. We tried to explain that we were at the bottom of the climb across the street from where we were let out when he drove by but our Spanish wasn't up to the task. The driver said stuff like "he had passed by" and "first bus" and some other words we recognized like "crossroads." In the end we don't know if he had come to pick us up first at 8:00 and missed us then somehow didn't see us at 8:20 after picking up the other passengers or if we were supposed to have gone to the crossroads to be picked up. In any event, we got taken back to town in plenty of time for dinner. We had dinner at the Parilla Don Juan and had an Argentine specialty, parilladas, which is a variety of roasted meats and sausages cooked slowly over a fire. It was all fairly good except for the blood sausage (which was probably very good too, but an acquired taste) but there was so much food we just ate what we liked best. We had ice cream for dessert which was really great. Finishing up our meal a little after midnight we declined coffee. What are all these other people, the place was packed, doing having really strong after dinner coffee? Don't they sleep! We had a slow leisurely day today. After breakfast we went for a walk down to the east end of town. We stopped in at a bakery and then stopped at a cafe for coffee. We didn't do much of anything until lunch when we went back the Ideal and had very good cannelloni and gnochis. After lunch we both fell asleep and slept away the afternoon. Luckily it stays light till late so we were able to take a long walk around the town starting at 8:00 pm. We went to the west end of town and then started heading up the road that goes to the Martial Glacier. We didn't make it there, but got high enough to have a panoramic view of Ushuaia. The houses are small and cute with extremely steep sloping roofs suggesting serious winter snows. There is new construction going on everywhere. The place is growing rapidly and almost every yard has a dog. We came back to town and had dinner at the Moustacchio. The food is good but the atmosphere is somewhat stiffer than at the Ideal. Today we took a 12 hour cruise along the Beagle Channel in a large catamaran. The brochure says "If you are the type of people who enjoy a maritime excursion on the Channel Beagle, then you will want to travel with this adventure. ", but the guide's spoken English is far, far better. The catamaran holds about 60, but there are only about 30 people on board, so there's room to move around, change seats and stretch one's legs. There's a heated, glass-enclosed inside area, a very windy but mostly dry upper deck and a very wet walkway around the outside on the lower level. We could have used our GoreTex pants for the first time, but we left them back in the hotel. At one point early in the cruise we go outside to get some fresh air and are splashed with spray. We aren't soaked, but we would be if we stayed out for any length of time. In the morning we passed by islands with sea lions and cormorants and saw a number of albatrosses fly past as well as a couple of petrels which look like albatrosses but are darker in color. The sea lion island is on the "itinerary", and we stop for about 10 minutes to watch about 50 sea lions in various states of agitation: sleeping, resting, grunting, walking around, bellowing and fighting. The "imperial cormorants" are a medium-sized black-and-white sea bird. They can be mistaken for penguins from a distance (OK, from a great distance). Next stop: the wreck of the Sarmiento, which had been a hazard to shipping in the middle of the channel until a few years ago, when it was dragged to its present location in one of the bays. We also see, but do not stop at Estancia Remiggio, on the Argentine coast in a protected bay. This is the second or third permanent European presence on Tierra del Fuego, c. 1890. We stopped at the Refugio Almanza for lunch. It is directly across the channel from Puerto Williams, a military base in Chile. We took a walk on the beach which was littered with huge pieces of driftwood and millions of mussel shells. There have been signs everywhere warning of the danger of "red tide", and the "peligro de muerte" if you eat any shellfish. Across the Beagle Channel there is another channel leading south which goes directly to Cape Horn 90 km distant. After lunch came my favorite part of the trip. A stop by the Pinguinera (Penguin Rookery) to watch and photograph the penguins waddling about. On the way we pass by an island formed of glacial debris. There are some odd-shaped hills at the waters edge which the guide calls "drumlins". I think I've seen this word before only in crossword puzzles. On a small island (more of a large rock) next to "Drumlin Island" (not its real name) we finally encounter the penguins. We could not get off the boat, so all the tourists crowded onto the pontoons on the front trying to get a good look. Lynn used the telephoto lens and I used the binoculars. The penguins just went on about their business, waddling to and fro, preening, swimming, sleeping. It's a relatively small colony of a few hundred Magellanic or Jackass penguins. They summer here in the south and migrate north to warmer water in the winter. After the penguins came a ~1 hour stop and tour of the Estancia Harberton. A residence established by Thomas and Mary Bridges in 1886. It is still owned by the Bridges family (I think the great grandson of the founder still lives on the premises) and sheep are still raised and shorn in the original shed. The complex of buildings is incredibly picturesque despite somewhat gray skies. The fields are covered with yellow and white wildflowers and grazing horses and sheep. The buildings are white with red painted corrugated iron roofs. Corrugated iron seems to be the building material of choice in Patagonia. I wouldn't expect it to survive the sea air and wet conditions, but even the expensive new constructions going up in Ushuaia use it. The Bridges were the first successful missionaries in the region and I got the book written by the Bridges son, Lucas Bridges, "The Uttermost Part of the Earth" at the gift shop. We also learned that grass was introduced to Tierra del Fuego in the late 1800's possibly as seeds stuck in someones shoes. It is hard to imagine what is was like before since the place is carpeted in green today. The estancia has some interesting features, including the "oldest vegetable garden in Tierra del Fuego", growing onions, carrots, and several other cold-resistant veggies. They also maintain a sort-of botanical garden with examples of many of the native flora in a fairly natural environment (well, except for the identifying signs and the footpath). I found the botanical garden to be straight out of the Legend of Sleepy Hollow, or maybe the Forest of the Ents in Tolkein. Dense foliage. Gnarled and twisted tree trunks. Lichens and other parasites hanging off many of the trunks and branches. The overall impression was quite eery. All it needed was a moonless night and a howling wind (not an uncommon occurrence). We got another guide at the estancia who was very well informed about the history (both natural and human), and who spoke excellent English, as well as French. She denied speaking good French, but the numerous French tourists prevailed upon her and although she gave her initial descriptions in English, she answered their questions in excellent French (their assessment, not mine). I am always envious of people who have had the talent and/or the opportunity to learn several languages well. I have had an opportunity to learn many languages very poorly, and none (save English?) at all well. After Harberton we had ~4 hours trip back to Ushuaia. There was one unscheduled stop when the boat pulled over to pick up an old man with a hat and a young man with a gun standing next to a dead horse on the beach. We left the horse. Sometimes it's better to not ask too many questions. Back in Ushuaia we were the first to arrive for dinner at 10 pm. The place was beginning to fill up by the time we were finished. I haven't fully gotten used to this late night dining, but it is absolutely wonderful for the traveller. One can stay out sightseeing till quite late, sure in the knowledge that restaurants will be open upon your return. If you return to your hotel room at 9:30 pm, you don't have to worry whether a few minutes spent taking a shower and changing clothes will mean the restaurants will be closed. Another beautiful sunny day in Tierra del Fuego. I heard it raining a little in the night last night, but otherwise the weather here has been excellent. Not the 50 mph winds and rain we had expected to encounter at least part of the time. Our morning was spent in search of money. We have traveller's checks and need to find a place to cash them so we can check out of our hotel (which doesn't accept credit cards) and catch a 11:45 am flight to Rio Gallegos. It appears that banks do not open until 10 am so we relax at a cafe until then. We sit in seats by the window and watch people going in and out of the post office across the street. We see one person who looks like a tourist come out and put letters into the box I put my postcards in a few days ago. If it's not really a mailbox, then someone else also threw out their letters. At 10 am we resumed our quest for cash. The rest of the city seemed to be doing likewise. At Banco Nacional there was a tremendous line and it wasn't clear that it was the correct line. We checked the next bank a couple blocks down, also a tremendous line. There are a number of German tourists with traveller's checks in hand on a similar quest. John went to the tourist info office and I went to a third bank and got in line. It turned out to be the right place to be, and the fee to change money is $8 regardless of the amount so we decide to change a lot so we don't need to do this again soon. If we visit Argentina again I plan to bring more in cash and utilize credit cards to avoid the hassles of changing traveller's checks which are not popular at all. Money in hand, we check out of the hotel about 11 am and get a cab to the airport. Plenty of time to spare. The Ushuaia airport has no x-ray facilities and only one gate which explains why it was so crowded when we landed. Everyone ready to leave is crowded around the gate and everyone getting off the flight that just landed has to push through the crowd. We learned yesterday that they are building a new airport with a longer runway so landing won't be as much fun for future visitors. The flight to Rio Gallegos landed at 1:30 pm and we arranged to take the 2:00 pm bus to Calafate (fortunately the bus left from the airport). We got the last two seats. Third to last went to a Swiss guy with a lot of camera gear who had been on the Beagle Channel cruise yesterday and our flight today as well. The trip to Calafate took ~5 hours and traversed flat terrain that appeared totally barren from the sky. In fact it is covered in scrub much like the deserts of western North America. The road was paved and the bus large and would have been comfortable except that the air conditioning system wasn't working properly and the windows were the type that don't open so it was extremely hot and stuffy. This is definitely "Big Sky" country. The brown scrub extends, seemingly forever in all directions to a flat horizon surmounted by a deep blue sky. There are puffy white clouds scattered above. In the far distance we can make out the Andes mountains. I remember reading that when settlers crossed North America in the 19th century they could see the Rockies from hundreds of miles away. Here in Patagonia the air is still that clear. Finally we arrived in Calafate and quickly made arrangements for transport to the Moreno Glacier for tomorrow. Since the company needed a hotel from which to pick us up they called around until they found a vacancy in a mid price range hotel, so finding accommodation was made easy. We found a nice little restaurant specializing in pastas for dinner with a waitress patiently giving minor Spanish lessons to the assortment of nationalities eating in the place. The Lonely Planet guide book really dislikes Calafate, but we haven't found a problem with it. While it's main business is clearly tourists coming and going to Parque Nacional Los Glaciares, it does not seem to have the outrageously inflated prices nor the unreasonably surly hoteliers that Lonely Planet warns about. As tourism-driven cities go it is neither especially good nor especially bad. There are a lot of rose gardens and nice houses comprising the small town. Our hotel is fine and we found some good restaurants. There aren't a lot of large trees so the place is a bit windy, but otherwise the weather is warm and sunny. Every breakfast can be an adventure when you don't speak the language well. Wanting croissants for breakfast and not seeing them out to point at posed a minor difficulty. We communicated something along the lines of bread but not bread which prompted the waiter to pull out and show us various things in the kitchen. We learned croissants are called media lunes (half moons) for future reference. Today we took a trip out to the Perito Moreno Glacier, el patrimonial mundo, or World Heritage Site as determined by UNESCO. A minor (or maybe major) goal of ours is to visit all of the UNESCO sites. At last count there were 379 and more are added every year. We have now visited 39, including one on every continent. While many are easily accessible in Europe and North America, many others are remote or pose other difficulties (e.g., civil war). Our goal may not be attainable unless we make a career change to a new profession like National Geographic photographer :-). The challenge makes it all the more interesting. The complete list of UNESCO sites is here. The glacier is too spectacular for words. It is both a visual and auditory experience. Visually, it's exactly what you think a glacier should be. A huge wall of ice extending up into the mists that hang over a long valley. The front is 4 km long, and it is probably about 150 ft high. You can approach it two ways. Un launcho (not to be confused with lunch) takes you out on Lago Argentino up to about 300 m from the front of the glacier. It looms large over you, and icebergs float past. The front face is incredibly craggy and broken and twisted, and also a deep blue color. The second approach is from a bluff toward which the glacier is advancing. The park service has installed several walkways in this area which afford spectacular views of different sections. Prior to the installation of the walkways it was possible to climb down to the base of the bluff, which was very close to the face of the glacier. Unfortunately, several tourists had been killed over the years by falling ice and the waves they generate. We spent about two hours on the bluff watching and listening. We took an awful lot of pictures, some of which actually came out, although it's hard to capture something 4 km long and 150 m high in a 4x6 inch frame. The surprising aspect of the glacier is that it actually does something before your eyes. It's moving at about 30 cm/day, which may not sound like all that much. (Your typical garden snail would not need to sprint to get out of the way). 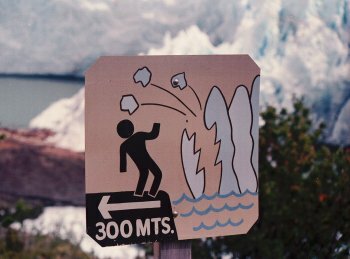 BUT ... watch for ten minutes and you hear a loud thunderclap and a car-sized block of ice drops off into Lago Argentino. Watch for an hour and a house-sized block falls off, forming an iceberg that will drift downstream for many miles before melting. Very few of the World Natural Heritage Sites "do" anything. They simply "are". The Moreno glacier is a rare and spectacular exception. We were very fortunate and caught the glacier on a clear sunny day with excellent visibility. Evidently, from what we've read and heard from others, that was a rare piece of luck for us. The bus we took from Calafate was a large one, less than half full. On the way we saw a beautiful rainbow that ended exactly on the road directly in front of us. Alas, when we reached the spot, the rainbow and its pot of gold had disappeared! There was a group of Spanish girls on the bus one of whom had been studying English for 11 years and practiced her English by translating what the guide said for us. We would have understood only about half of it otherwise. For a while she was talking about the "ships" and who owned them, but it turned out to be "sheep" and she now knows all the conjugations for sheep shearing and that after a sheep shearer finishes his work the sheep is shorn. One fact that we would have missed without our helpful acquaintance was the fact that one of the large local estancias (Estancia Condor) is owned by Queen Elizabeth of England. I'm surprised she hasn't sold it off (or had it nationalized) due to the somewhat frosty relations between England and Argentina. The bus company we have been using has stationery, and logos on the back of their buses that say "Las Malvinas son Argentinas", so the episode is not completely forgotten. There was an amusing older German woman travelling alone and a lone Japanese man also on the trip. We overheard an English woman (who spoke Spanish fluently) tell the German woman "you miss so much if you don't speak the language." The German woman seemed unperturbed. Presumably she agrees with us that while the experience is surely different if one speaks the language, it is no less rewarding or interesting. After a great day at the Glacier we returned to Calafate and had dinner at a place with excellent food next door to our hotel. It had been full up the night before and we couldn't get a table. Our Swiss friend with the big Canon lens from Ushuaia was there both nights and gave it a thumbs up as we came in the door. He'll be in LA later in the year so we gave him a business card so he can look us up. We also did a little shopping and visited a super market and picked up some snacks for tomorrow. The supermarket had an odd assortment of items. For example, the Soap and Detergent aisle was reminiscent of home: an absurdly large selection of products, all essentially identical, and all claiming to be Brighter, Cleaner, Sunnier, Lemonier, etc. The canned foods, however, were very limited, as were the fruit juices and the fresh produce. We settled on some tangerines and chocolate plus some croissants from a bakery near by. We noticed the price for Coca Cola was about the same as that for Heineken. We went to the bus offices to confirm our seats on tomorrow's bus to Rio Turbio. This involved a great deal of shouting into a very staticy radio, but apparently all is fine. The Lonely Planet mentioned that telephone service is erratic in Argentina, so the bus line must use the radio as a backup.